HEF Koushik Shankar is not good with directions. By the time we realise hea��s been telling us a�?Fourth Main Roada�? when he meant a�?Fourth Avenue Road,a�? my friend and navigator is ready to shoot him. Thankfully, she doesna��t have a gun and the good chef greets us with apologies and distracts us with a list of 18 dishes that he wants us to try at the just-opened Cleoa��s in Indira Nagar, Adyar. The grill-cafe is aiming at steampunk aesthetic, with lamps hovering low over the tables, so at least your food is brightly lit. It may feel dark in the day time though. 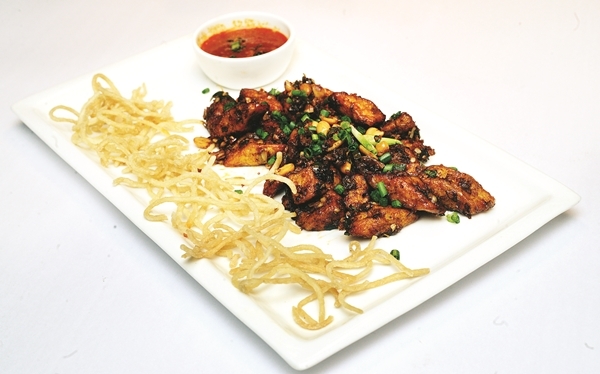 Our parade of 18 dishes comes from the Indo-Chinese, Indian and world cuisine a�?kitchensa��. Ita��s a kind of a�?multi cuisinea�? (though the chef wouldna��t agree with that I suppose) experience, that is aimed at office goers and young professionals who eat out regularly. The menu says no MSG or artificial colouring is added, and the chef says the idea is to expand to other cities a�� Bengaluru for one a�� and provide late night home delivery options as well. To that end, prices are relatively low, and the menu leans towards comfort and familiarity rather than innovation. Of the starters, theA�Chinese Chaat (Rs 129, crunchy, hot-and-sweet) and the deceptively mild Chicken Piquante (Rs 199, packs some heat) are worth a try, but my personal favourite is juicy crab claw lollipops that come with a Sichuan sauce (Rs 199). The Cordon Bleu Chicken Burger (Rs 299) is hugely popular among the body building crowd Ia��m told and it is quite tasty, though too much for me (cheese+egg+chicken stuffed with cheese+buns=Ia��m too old for this).